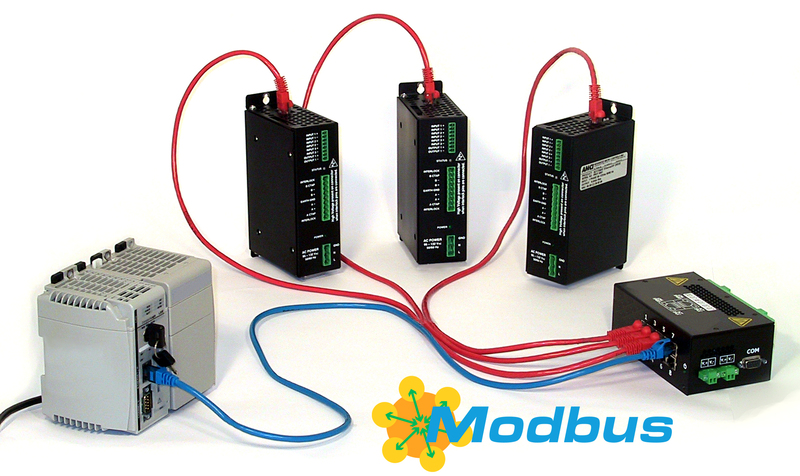 Advanced Micro Controls Inc. (AMCI) has enhanced its industrial Ethernet stepper indexer/drives to include Modbus TCP connectivity. Advanced Micro Controls Inc. (AMCI) has enhanced its industrial Ethernet stepper indexer/drives to include Modbus TCP connectivity. This additional protocol greatly extends the potential of AMCI’s SD31045E & SD17060E in PLC-controlled applications. The powerful (4.5 & 6.0 Amp RMS) AC line powered stepper motor controller/drivers eliminate the need for a plug-in card, and are easily configured through the host PLC software. AMCI’s E-drives offer system builders a choice of open or closed loop control modes, and come standard with a variety of features. AMCI’s SD31045E & SD17060E stepper indexer/drives provide up to 4.5 Arms or 6.0 Arms (respectively) of output current and boast a wide range of features. In addition to Ethernet-based connectivity (Modbus-TCP & EtherNet/IP), AMCI’s E-drives feature onboard indexers, encoder feedback, microstepping, programmable output current, anti-resonance circuitry, vari-step velocity control, compact design, and simplified set-up. AMCI’s Ethernet-based stepper indexer/drives are self-contained with their own power supplies, can be installed into tight spaces, and offer panel or side mounting for increased flexibility. The SD31045E offers high voltage 230 VAC to meet European standards. Founded in 1985, Advanced Micro Controls Inc (AMCI) is a leading U.S. based manufacturer with a global presence. Our industrial controls improve the performance and profitability of today's factory and automation systems. AMCI specializes in the design, manufacturing, and sales of eight different product families. Long standing relationships with the biggest names in industrial automation enable our team to deliver innovative, competitive products that are designed for years of reliable performance.